Join in the BIG PRINT event at Tanks Market Day, Tank 5. You and your family and friends are warmly invited along to dance the 16m print into being. 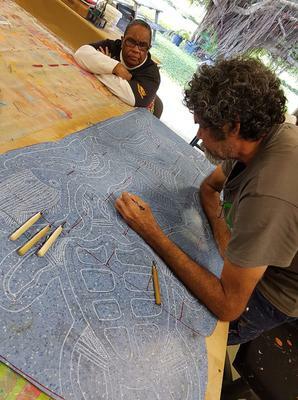 From 9am Inkmasters and volunteers will ink huge Lino Blocks created during several workshops in schools and indigenous communities. At 11 am the audience are invited to join the artists to dance to the mmusic of the Cairns Pan Stars Steel Orchestra. The BIG PRINT will be revealed at 11.30am, and then show at Cell Art Space Gallery, 1-19 August, 109 Lake St and later travel to schools and communities. Please share this event. You are cordially invited to the launch of this spectacular exhibition of selected art works from local, regional, national and international artists at 6pm Friday 27 July at Tanks Arts Centre. Prior to the launch at 5.15pm Simon Wright from QAGOMA will give a talk posing the question: “What keeps me awake at night?” Why art matters to us and what art issues should matter to everyone. Simon and Michael Healy MP will then award the $15,000 for the 9 prizes on offer. Free entry. Live music, finger food and cash bar. Please share this invitation!